Today, we are going to be contemplating yet another Euro game centered on the theme “Merchants in the Mediterranean.” This theme is usually just pasted onto a set of mechanisms, and Finca does not completely blow that cliche out of the water. 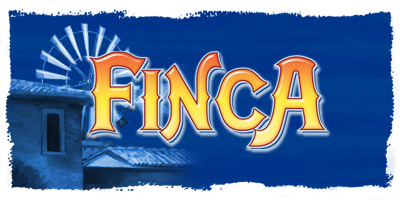 However, what sets Finca apart is its re-playability as a 2-player game…it excels with two. It also contains a pretty high level of interactivity for games in this genre. Finca was my first experience with the Rondel mechanism. Each player has two workers on a windmill (a circle with fruit on each blade). There is also a map with various locations to sell your fruit once you have collected the correct combination. On your turn you can…Harvest from the Rondel, make a delivery to a particular region, or use one of your 4 bonus tiles. The fruit harvest is by far the most interesting mechanism, as you move one of your farmers exactly as many spaces as their are farmers on your current tile. The tile you land on provides a particular fruit in the amount of farmers on that tile. So, you are constantly weighing how much fruit you want versus the number of spaces you are giving to opponents. This is particularly tactical in a 2-player game. The rest of the game is pretty straightforward and smooth in its implementation. In each region, there are several chits with a combination of fruit and the victory points if you earn it by collecting those fruits from the Rondel. you also have 4 single-use tiles you can use on your turn where you can…move a farmer to and blade on the Rondel, make two farmer moves in a row, make a 10-fruit delivery, and a one fruit discount on a delivery. I almost forgot to mention the Donkeys! In order to make a delivery, you need a donkey. You collect a donkey every time you pass one of the two donkeys on the Rondel…creating yet another interesting decision point every time you decide to harvest. Fantastic! 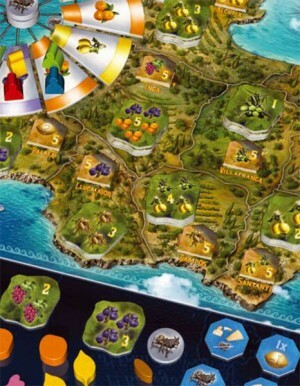 Finca is a fantastic introductory Euro…especially if you have not played a game with a Rondel. Even though it is good with any number of the 2-4 player range… it is EXCELLENT as a 2-player game. Usually 2-4 player games are not really good with 2….but that is not the case with Finca. I’m not certain this game would work with Ameritrash lovers. However, it can be played in 45 minutes, and is more interactive than 75% of all other Euros as you play “tug of war” on that Rondel. It’s also pretty gratifying to swoop in and take a chit you know someone else is saving up for. All in all, I highly recommend this for people looking for another family weight Euro game, or a great game for 2 players (great for couples). It might even appeal to non-Euro gamers due to the interactivity that can really get tactical on the Rondel. It’s out of print right now, but if you can find a copy at a reasonable price… get one! Bought this game as an introduction to strategy gaming for my 8 and 11 year old daughters. It worked perfectly. There is a fair amount of strategy to keep gamers interested, and the fruit pieces are gorgeous! The pieces really make the game for the children, they are bright, fun and very unique. The play strategy is really individual and never conflicting, yet all moves affect other players. If you have any aspirations of starting out your children as gamers or like to play games as a family, this game is perfect for that. Add a Review for "Finca"